When it comes to hair care, one topic that gets a lot of attention is the infamous protein/moisture balance. And there is a good reason for this. Our hair is made up primarily of protein and moisture, and both elements are held together in a careful balance. The hair breakage we experience is most often the result of an imbalance between the protein and moisture elements that make up the hair strand. The relationship that exists between the protein and moisture balances within the hair strand is not simply a case of balancing opposing forces one over the other to prevent hair breakage. These two components work together to produce a healthy head of hair, and neither can work well without the other. Moisture is basically water, not oil or any other substance. Our hair needs water to maintain its elasticity, or ability to stretch. Without it, our hair feels dry and produces a snappy kind of breakage. Since water is the ultimate moisturizer, water-based products are best for really getting the greatest moisture benefit. Moisturizers are simply products that are water-based and nourish your hair deep within the strand. 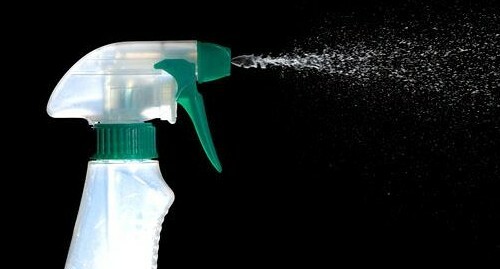 Products with moisturizing properties tend to be conditioners, leave-ins and other moisturizer sprays or creams. Moisturizers may also contain large amounts of protein, but these protein-based moisturizers do not have the moisturizing benefit that moisture-based moisturizers have. Check labels to gauge protein content. Good moisturizers will not contain cheap, filler ingredients like petrolatum, mineral oil, or lanolin. 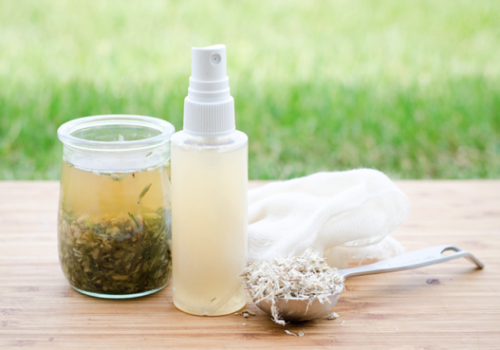 Avoid products that claim moisturizing benefits and contain these ingredients. There is nothing moisturizing about them! Petrolatum and mineral oil are sealants that seal out the precious moisture our hair needs. 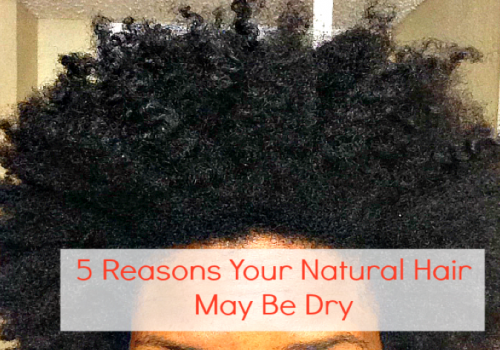 All throughout the day, our hair loses moisture to the outside environment. In order to keep our moisture in our hair, it’s a good idea to seal in the moisture with a heavier product. Oil. Natural oils like jojoba, olive, carrot, and coconut oil work best. 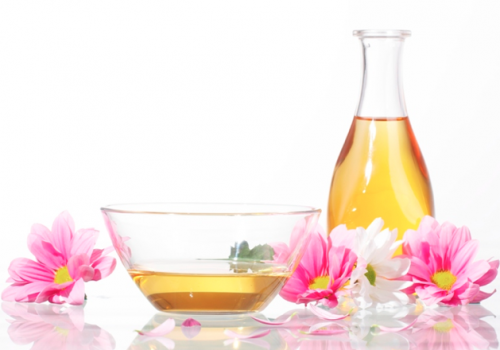 Oils are made of molecules that are too large to be absorbed by the hair strand. An oil (grease) can only coat the outside of the strand, and give it shine- the illusion of moisture. Oil molecules are hydrophobic which means they repel and do not readily mix with water. Applying oil to the hair coats it and traps the moisture that is inside, inside and the moisture that is outside, outside. If you use oils without a moisturizer (or before one) the oil will seal the moisture out of the hair strand and lead to a coated feel and eventual dryness. 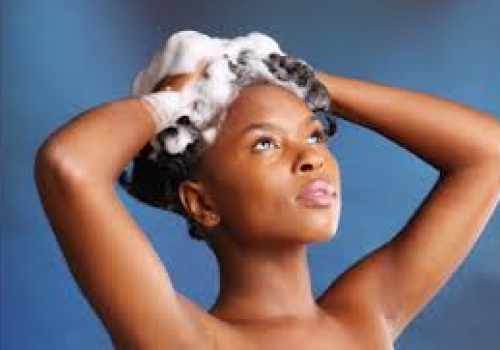 Fighting hair breakage and achieving moisturizing success is all in the order in which you apply your products. Remember, if you apply an oil product to your hair before you have added a moisturizing product, you have created a seal on your hair strand that water and moisture cannot penetrate. Protein is what gives the hair its strength and structure. Hair is about 70% keratin protein by nature. Proteins serve different functions and roles in hair care. Some enhance elasticity, while others reduce it. These proteins bind to the hair cuticle and help temporarily rebuild any weakened areas. Protein-based products reinforce the hair shaft, and help it remain strong enough to fight breakage. Some proteins are stronger than others, but daily or even weekly use of even the milder protein treatments may result in an imbalance between the protein and moisture levels within the hair strands in some people. This is where product percent composition really plays an important role. For example, every product that contains keratin protein is not going to feel the same way across the board, the same way that every product that contains glycerin or water is not going to feel the same either! The protein in question could make up 30% of the product or 0.3%! Who knows! You have to play around with different products to know how strong they are on your particular hair. Your hair protein tolerance will vary from product to product, not necessarily protein to protein. Protein is found most prevalently in products like instant conditioners (bargain brands like Suave and V05), leave-in conditioners, protein reconstructor conditioner treatments, and even some moisturizers. Women with relaxed or color-treated hair need more protein than others. If you are relaxed or color-treated, those processes have compromised the protein structure of your hair. Relaxing and coloring breaks protein bonds, and depending on the type and strength of the relaxer, and level of bond breakage you incur, you will need more or less protein than someone else. There are also some people whose hair is more protein deficient by nature (genetics, low protein dietary intake), so they require more regular protein than others to keep the balance intact. At the end of the day, you must experiment and get to know your own head of hair. Scenario 1: Kim’s hair is breaking like crazy and feels like a brillo pad. It is just plain crunchy and dry! Every time she touches it, pieces seem to just pop right off. Snap, crackle, pop. Combing is impossible without tons of little hairs covering her sink and back. Her hair feels hard and rough even when wet. She’s given it protein treatments because the product says it is supposed to stop breakage in its tracks and rebuild the hair. But so far, nothing is working and her problem is getting worse. Scenario 2: Trina’s hair is breaking like crazy as well. Her hair feels dry, looks dull, and is very weak. Her hair is too weak to withstand simple combing. It feels extra stretchy when wet and almost follows the comb as she pulls through to detangle. Her hair is just limp and has no life. She’s deep conditioned and done hot oil treatments on her hair once a week. Since her breakage began, she has stepped up the conditioning but her problem has gotten worse. 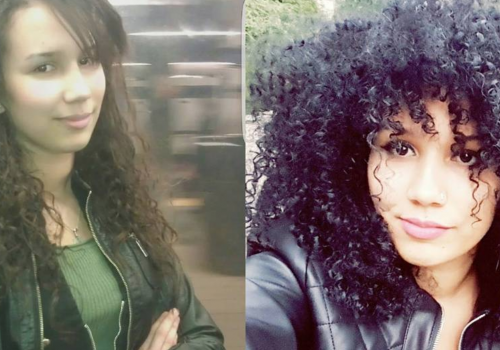 Both of these women have issues with hair breakage, but the solutions to their individual problems require two very different approaches. 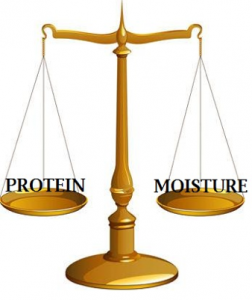 The two scenarios above perfectly illustrate what happens when the balance between protein and moisture is tipped too far in either direction. This article will teach you to effectively recognize the difference between protein based and moisture based hair problems and help you can organize your hair regimen to effectively combat these issues as they arise. Too much of a good thing can be a bad thing. Hair is not exempt from this old adage. Growing out your hair is a constant battle between maintaining even protein and moisture balances. 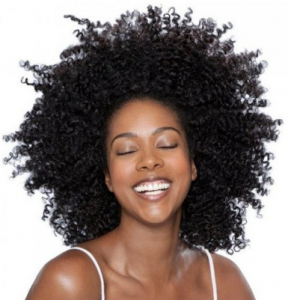 Hair breakage is the result of the hair chemistry being thrown off balance. Remember Kim and Trina from the beginning of the article? Hair that is shifted too far on either side of the balance (too much protein or too much moisture) will break. Though hair health assessments can be performed on dry hair, determining your cause of breakage is often easiest on wet hair. Hair in its wet state exudes the basic properties of elasticity and strength excellently. In fact, these qualities are often exaggerated on wet hair. Thorough and frequent wet assessments will help you maintain your hair’s health and condition. It would be difficult for you to wet assess your hair by holding a single strand and pulling on both ends. That type of stress would be considered “undue” stress, because no single hair is ever really subjected to that sort of tension at one time. Any strand of hair (healthy or not) that you pull on by both ends has the potential to snap depending on the pressure you apply to it. Hair should be wet assessed by the normal act of combing though it or touch-testing it. Unsure? Err on the side of caution and give your hair more moisture. 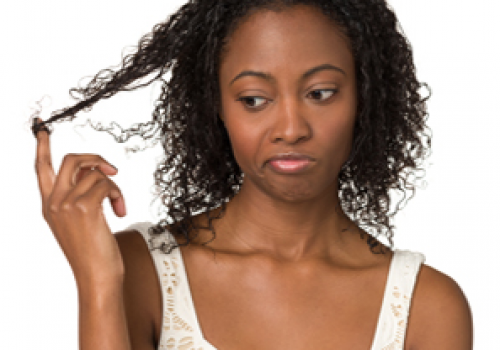 So now that you have figured out what type of hair breakage you have, what should you do? Hair that is shifted too far on the protein side will break easier, both wet and dry, because it lacks elasticity. 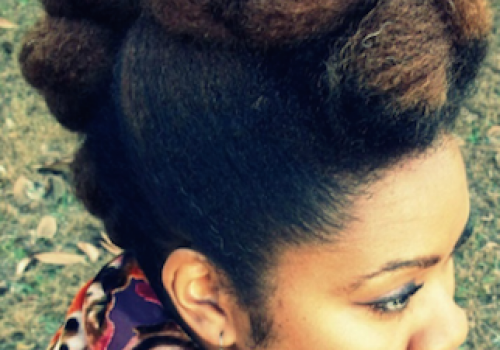 Elasticity is what allows us to style, stretch, and manipulate our hair without breakage. Hair that breaks with very little tension or stretching is a sign of an overabundance of protein, and a deficiency of moisture. Any type of stretching or tension will break it because the protein goes in and adds structure to the hair. Too much structure makes the hair rigid, and decreases its elasticity. The result? Brittle, breakage-prone hair. This was the issue with Kim’s hair. She was feeding her hair more protein than she needed to maintain a healthy balance. Clarify your hair with a really good stripping shampoo like Pantene Pro-V Purity ($3-$5) to remove any excess product buildup. Then, deep condition your hair for 30-45 minutes once, preferably twice a week with heat with a thick, creamy moisturizing deep conditioner. Apply a water-based moisturizer to your hair, concentrating on the ends daily. I would watch out for excess protein in common products like leave in conditioners, moisturizers, gels, and instant conditioners like Suave and V05. Protein hides in a lot of everyday products, so avoid those for a few weeks until your moisture balance is corrected. This will give your hair a chance to even out the protein/moisture balance. A list of product recommendations can be found at the end of this article. Yes! There is such a thing as “over-conditioning” the hair and Trina found that out the hard way. Hair that is shifted too far on the moisture side will be “super-elastic” and stretch more because it lacks a sound protein structure. Many people describe the feel of over-conditioned and over-moisturized hair as “mush-like” or “overly soft,” especially when wet. This kind of hair has a weak, limp, spongy feel to it. Protein deficient hair will tend to pull and stretch along with the comb and then break. It will always stretch first then break because of the low structural protein stores, and overabundance of moisture. Does this describe your hair? Listen up! Even if your hair is stretching without breakage you should use a light protein product to correct this. When your hair stretches, the strand “thins” and becomes weaker across the cross section. It may not break right then at that very point in time, but stretched out of and beyond its shape, it is compromised and will eventually break at some other point. Your hair should be springing back to position. If it’s stretching and stretching without breaking it may be your hair’s way of telling you, “Hey, I need a little structure (protein) here! I’m getting waaaay too elastic, but not yet enough to break– so do something now!” This is where a preventive maintenance protein application would come in. You don’t have to wait for breakage to act. Your hair is telling you now! Start light, and work from there. You may not need a heavy protein treatment just yet. Some individuals like to schedule moderate protein conditioning treatments, however, I do not advise “protein-ing” on a specific schedule. Scheduling is good for when you are just starting out and getting into the groove, but you will soon start to see that your hair often has its own plan for when you need different things. Setting aside a week or two in your regimen for protein conditioning is just not effective at addressing your hair needs as they arise. Hair does not know or understand our “schedules.” Its needs and wants change from day to day, week to week. Treatments should only be done as you need them. Sometimes that might be weekly, other times it may be every 2 or 3 weeks! Only your hair can dictate that to you. Now, once your hair is balanced and the breakage has minimized, you can try to maintain the balance for as long as you can by interchanging your moisture and protein based products. It does not have to be on a particular schedule. With time and some patience, you will master this delicate balancing act. Happy hair days! This was wonderful information; very thorough and easy to follow. I recently bleached my hair which ended up totally changing my hair 4C texture. Now, it seems that my hair is on the fence between needing both protein and moisture. How do I move forward in obtaining the proper Balance for my hair?